In the city of Cobble, Orio must depend on help wherever she can find it; however, her assigned familiar, Bauble, has his own agenda. As the two explore the walls of the city, they find they are not the only new arrivals. Set in a mysterious world of dolls, puppets and stuffed animals come to life, Hinges is a story we’re dropped right in the middle of and left to figure out for ourselves – which is exactly my favorite kind. And so our story opens on Orio, a doll opening her eyes for the first time in the clockwork city of Cobble – and as she stumbles through her first bewildering day of life, we follow along, trying to figure out exactly what is going on along with her. And easily my favorite part of this story was just how much there was, teaming beneath our understanding – the art imparts a wonderful fairy tale-like sense of foreboding, even when nothing overtly threatening is going on, such that we’re left with a delicious sense of unease, along with many a tantalizing hint at things we don’t yet understand. Something is definitely not quite right in the city of Cobble – and that made for an electric read. Plus I also just downright loved the art of this story, which is somehow both stark and lyrical at the same time. From the clockwork gears to the finer stitches, these panels inexorably draw the eye – and as this book is predominately silent, the art has plenty of space in which to shine – though I will say, and really this is my only complaint about this book, that I did find some of the action to be a bit confusing to follow at times. More than once I had to stop, blink, and stare for a beat to figure out just exactly what was going on – who fell through the floor, say, or who had just thrown what – but whether that was a deliberate artistic choice on McClaren’s part or not, I can’t say. To me, it did feel like occasionally there was a beat missing, but it was never enough to make me lose interest in the story – and so I was able to overlook it pretty easily. And of course, we can’t forget Bauble, the other main player in this story. Orio is barely awake five minutes before she’s quickly shuffled into a room to choose her Odd – which is essentially kind of a stuffed animal familiar – but Bauble is clearly no ordinary Odd. Odds are supposed to be inert, lifeless; blank slates until they’re chosen – but with Bauble, that is definitely not the case. In fact, Bauble seems to be the one who chooses Orio, and not the other way around – and as adorably ugly as he is, there’s also a dangerous underbelly to this fluffy minion. Because not only is he a misfit with a penchant for trouble – one that might remind you of Lilo’s Stitch – but he also definitely has some kind of angle. And what that all means for Orio, well, it’s too early to tell – but I was definitely left with the unsettling impression that Bauble doesn’t necessarily have Orio’s best interests at heart. Which only left me all the more intrigued. So in the end, I really enjoyed this story – for its hypnotic air and mysterious ambiance, and for how it never once coddled or spoon fed us. 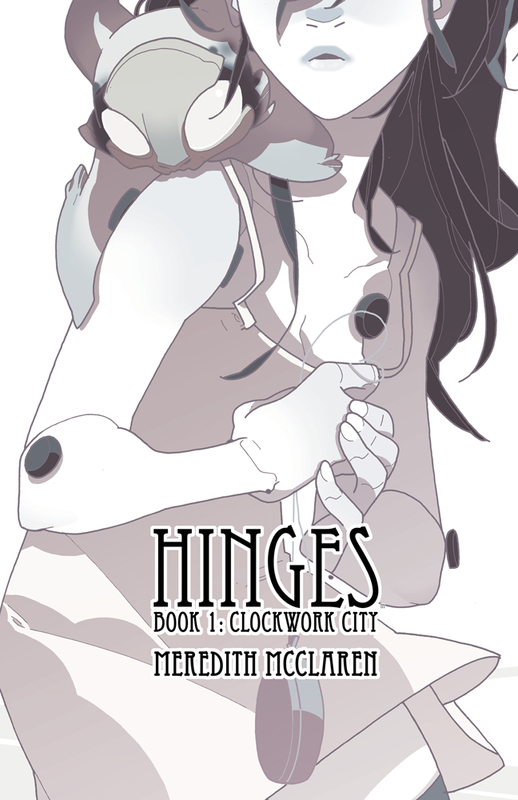 Adorably creepy and delightfully foreboding, Hinges reads like the start of one of my favorite kind of fairy tales, and I cannot wait to see what happens next. …Hinges is a comic with a lot going for it. A unique style, jaw-dropping art, an intriguing storyline, and a fascinating world to explore. Although I wish that the comic would move a little faster, I’m still going to be following this one, and I can’t wait to learn more about Orio and Bauble and their adventures in Cobble. Hinges Book 1: Clockwork City is the latest example of a modern masterpiece within the comic book medium. The incredibly talented creator Meredith McClaren takes the story of “a boy and his dog” and puts one of the most imaginative, charming spins to the classic tale.